And they're off...In the most hilarious action adventure chase of the century starring the Road Runner and Wile E. Coyote. Road Runner Death Valley Rally features 20 levels of cartoon-like graphics and hilarious game action that will leave you wanting more. Wile E. Coyote will challenge you with crazy antics involving TNT, catapults, rocket skates and more--courtesy of ACME, or course. As the Road Runner, you must jump ravines, pick up power-ups and peck to disable wacky contraptions to avoid danger at turbo-speed. --From the SNES Road Runner's Death Valley Rally instruction manual. 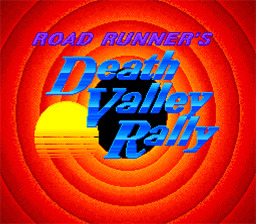 Play Road Runner's Death Valley Rally Now!